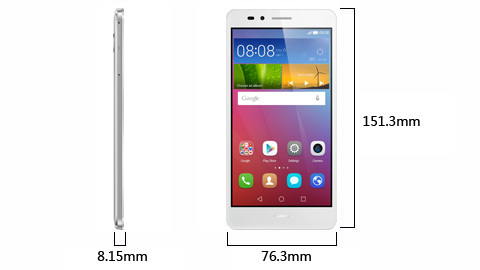 The Huawei GR3 4G Smartphone features a 5.5" HD display, 13 megapixel camera, 2GB RAM and Octa-Core Procesor. This phone has excellent features yet with an affordable price that will not hurt your wallet! PLEASE NOTE: This handset has 1x 2G SIM Slot and 1x 4G SIM Slot. As the 2G Network is phasing out in Australia, the 2G Sim slot will not be working in Australia. Don't miss a second of your life. A 13-megapixel f/2.0 camera makes the Huawei GR5 an essential tool for keeping track of all the colorful moments in life. What makes the photography experience so incredibly special are the different filters you can use to enhance the minute details and colors of each photograph. The Good Food photo filter brings out the natural appeal of delicious courses and makes your food look as good as it tastes. The powerful 3000mAh battery perfectly affords long time entertainment and task. Even the charge period has been shortened. You will spend less time waiting and much more time on fun, with Huawei GR5 a perfect companion.